Carol Kaye is one of the most prolific recorded bass guitarists in rock and pop music, playing on an estimated 10,000 recordings in a career spanning over 50 years. Kaye played on hundreds of commercially released recordings and soundtracks. This list represents only a small fraction of her recorded performances but they are the most recognizable. I hope you will check this video out and read a little about Carol too, she has a very amazing story and I think you will find it to be very inspirational. Erasmus found Jingle exactly where she was everyday at around three o’clock in the afternoon. Today there was someone on the swing, twirling around and around seemingly oblivious to the man and woman watching them. Jingle raised her hand to the figure on the swing. ” No. I hadn’t heard that.” She turned away from the window and Erasmus wasn’t she if that look of impatience and disgust was for him or the uninspiring Twirler outside. ” You’re kidding me, right?” she asked. Jingle cleared her throat, but to Erasmus it sounded like a growl. Erasmus left Jingle to her quest for inspiration and he wondered, exactly what it took to scare a woman like Jingle. He wasn’t exactly sure he wanted to find out. Bancroft Manor: Creative First Aid. I listen to these songs when I write my Bancroft Responses- I wonder how much they’ve influenced me so far? surrounded by darkness and laughing river and a woman dressed in white dancing along it’s banks. no one had ever been there at all. In each of these pictures you can see the artist on her journey- she hasher paint brushes, her canvas bag- she is wearing comfortable clothes. In these pictures you will see that she is moving around, trying to find a comfortable spot and then in the last picture you can see her change, you can see her enter the zone. She is standing beautifully, like a dancer, like she is hearing music. This is what writing is like for me. or when I look up. I ride the same train to and from work five days a week. I take the same seat next to the window near the middle of the car so I can charge my phone, God knows why I hardly ever get calls or texts. I suppose I do that because it’s what one does and when one is in public- one makes the effort to belong. One day a new passenger got on the train and of all the seats she could have taken, she took the one in front of me. I did not because it didn’t matter what I said or did. I doubt if she even really saw me. The new person, phone in hand gave it a little swipe with her finger and then she disappeared, as most people do, into the small screen. New people chat or shift around in their seats and end up being a distraction. I don’t like to be distracted and I like my quiet-I wasn’t always such a solitary creature. I suppose I evolved into one. I take my book out of my backpack and found my place. You see I read real books with paper pages becauseI like the feel of them in my hand. They are solid, they smell good and most of all they ground me here and hold me here like an anchor would hold a boat or ship in place in a stormy sea. At exactly 4:12 just before the doors close the usual passengers pile in and claim their seats and as if they were performing some sort of dance together, they all sit and take out their phones and swipe the screens at the exact same moment and like the woman in front of me they disappear into their phones, into their own little worlds. I am alone now, in the car I ride every single day to and from work- sometimes I wonder where they all go when they jump through those little screens but I’ve never been curious enough to follow them. I have my book with paper pages and I carry my phone so that I will blend in-at least that’s the idea. But I guess I don’t really fit in and I suppose- as I hold my book to my chest, with my finger holding it open to the page I am going to start reading- by the look of those seats empty of people but each holding a small chattering, blinking phone, that might not be such a bad thing. 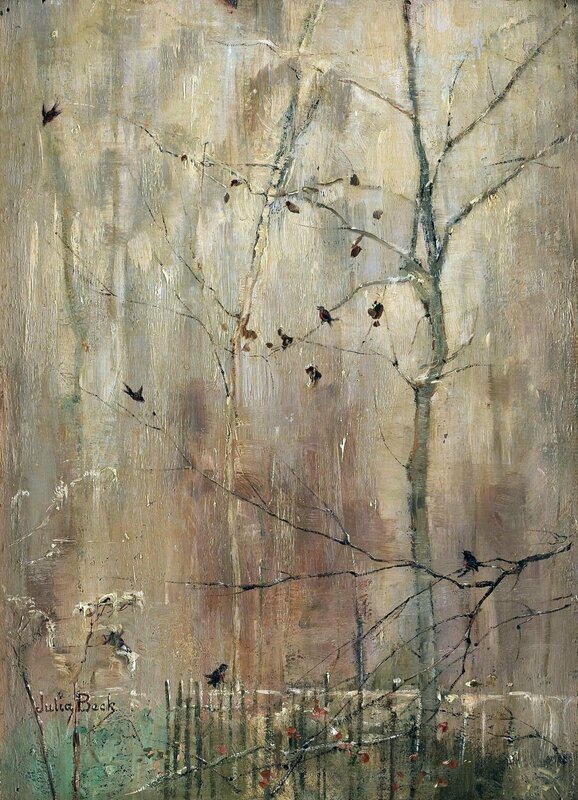 She was standing next to the shed where he kept his gardening tools with her hands behind her back. She had a shifty look about her and Erasmus looked from her face- which was not exactly unpleasant to look at- to the door of the shed which was still locked with giant new padlock. ” You must be one of the new residents up at the Manor” he said pushing his wheelbarrow full of tools in front of him. Erasmus motioned her away from the door before Jingle could finish. They both heard a truck engine roar to life. Jingle turn and ran back towards the house and as she ran Erasmus saw she was limping and he was pretty sure by the stiffness in her gait it pained her to run at all. But she did it anyway. He tossed the shovel against the shed and decided it was time to have a talk to Georgina. He wondered where she was at, because Untalented Groundskeeper or not, Erasmus knew better then anyone that a wounded beast was a dangerous beast. 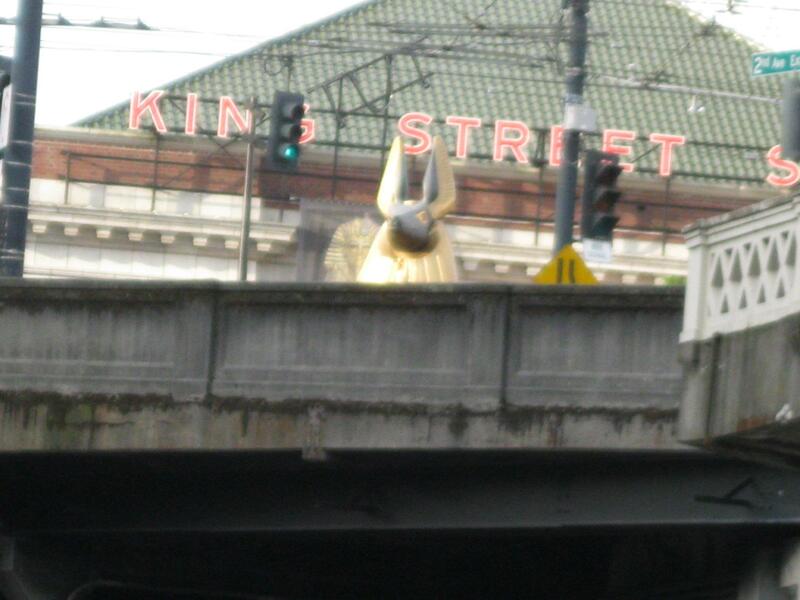 I work in a building that is below street level, right near the railroad tracks. When I look up I can see the part of the sky and the sides of buildings- some are brick, some glass and buses, I can always see them . I know. Exciting, right? I call it my Coffin view because if you laid down ( which I wouldn’t advise, so you’d have to imagine it ) it’s the view you would get if you were in a coffin. Really? I thought. Am I really seeing this? I walked up a little closer and looked straight up and in addition to f the usual brick and glass and bus tops – it really was there looking down into my coffin. 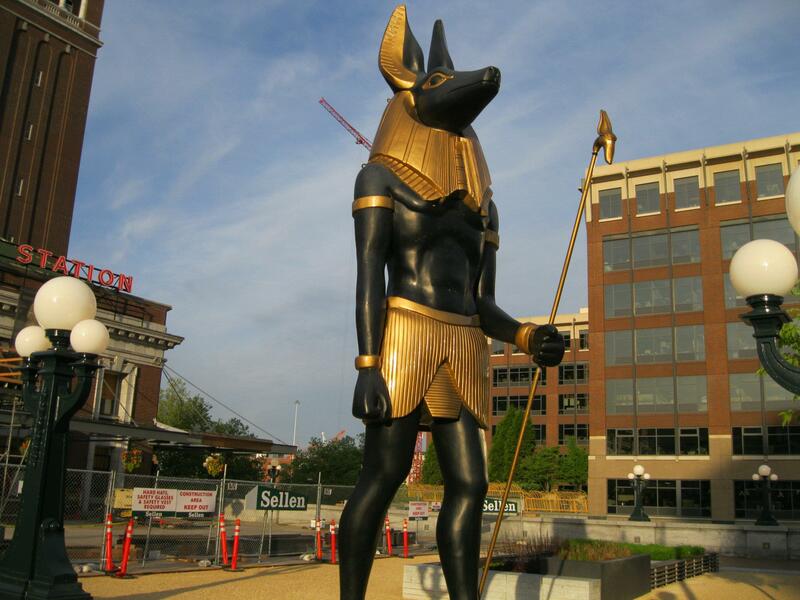 Anubis- and he was magnificent. 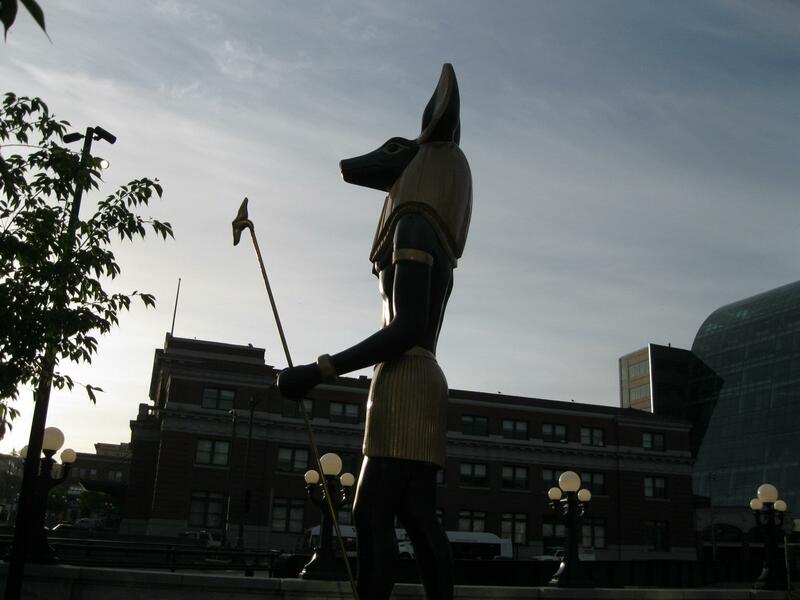 I had no idea what at the time what it took to set up a 26 foot tall 5.5 ton statue of the God Anubis to the corner of the street that overlooks my Coffin- I have no idea because from my coffin I can’t hear much of what happens on the street above. I’m guessing if you asked the segment of our former population that now resides underground they would say the same thing. 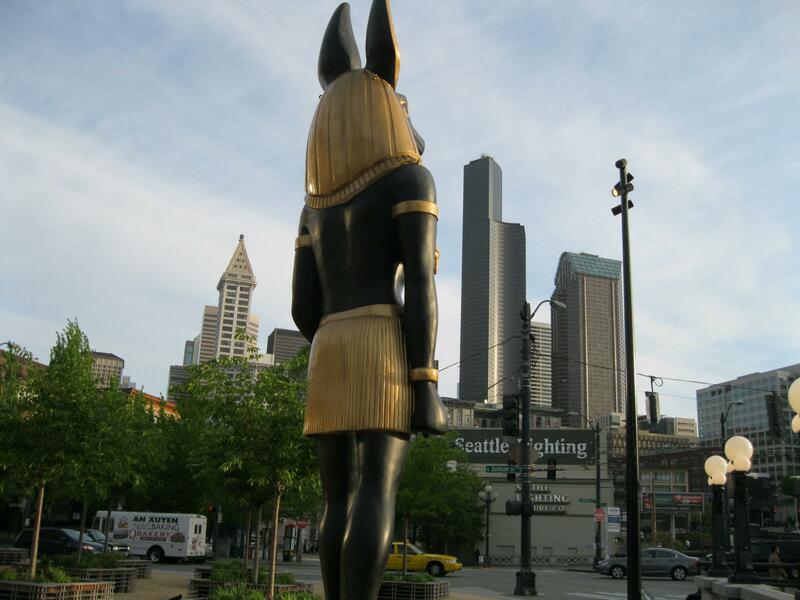 I spent a lot of time around the statue of the God Anubis during his visit to Seattle. After all, I had learned the art of embalming, I worked below the street where there are the remains of what used to be everywhere I walk and I write about ghosts and those little things that crawl into our dreams at night and turn them into nightmares. 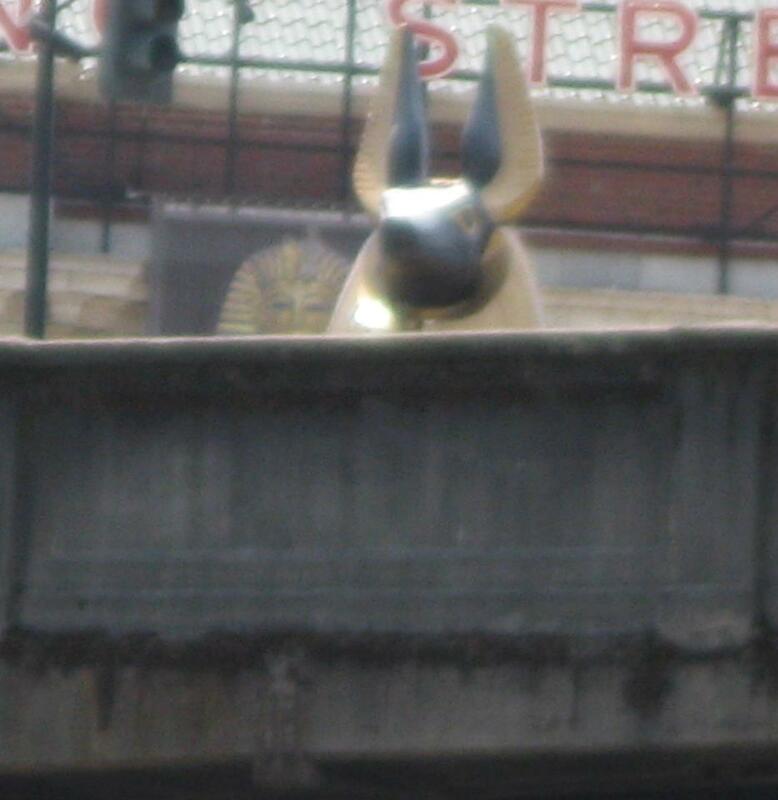 I’m very fond of this particular deity…color you surprised, right? Sometimes when I go outside and look up from my Coffin and my lip sort of does the Elvis lip curl because it’s a pretty uninspiring, bland smelly view but I remember this day and I have the pictures recoding the moment and I actually hope and think it’s possible that one day I see something this great again. I look forward to walking my dog because he makes me smile and when he’s done something well, like the time he found a bag of french fries in the bushes his eyes twinkle and his tail spins around in circles. In the evening I write and I play with words and I write poems even though I’m not technically any good at it because I’m NOT any good at it and nobody can stop me from trying- it’s about as rebellious as I get now days. I used to be a musician and I wore a leather jacket and I wore black eyeshadow before it was cool. As I was thinking about what it like to get home after work, what it’s like to reach my door ( at last!) 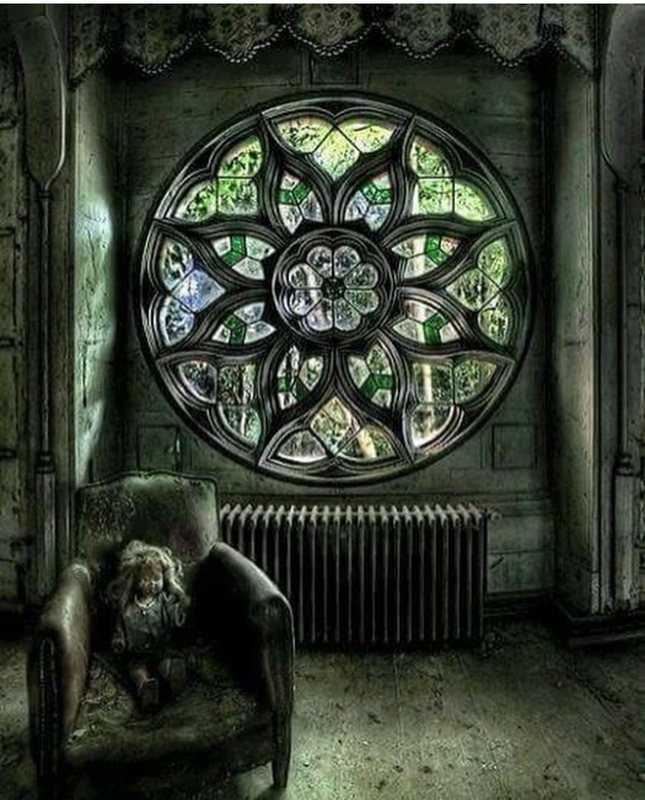 and put the key in the lock and turn it and push my door open and what it’s like to see my dog and my gargoyle collection on the mantelpiece and my cats on the couch and I just realized how I always exhale – I wonder was I holding my breath all day? What is THAT all about? Anyway, what I popped into my head was I can walk in and out of doors all days long- the ones at work, the ones on the train, and yes I guess I take a deep breath and I hold it what for? But there are other times, and there are other doors, like when I go to the symphony, or to the movies or to a museum or when I get on an airplane or a boat- the air just flows all around me and I think I know what it feels like to be a -kite one of those cool ones that look like a butterfly- and when I walk through that door I’m positive I’m going to fly.